Lovely red lips, perfectly shaped eyebrows, and flattering eyeliner. Permanent makeup holds the promise you’ll work all day, go to the gym, dance all night, and wake up in the morning with makeup in place. Permanent makeup is considered Micropigmentation, similar to tattooing. It involves using a needle to place pigmented granules beneath the upper layers of the skin. Delicate or sensitive skin areas may swell or redden, it is advised not to make social plans on the day of the procedure. Lip liner may appear “crusty” up to one week. If unwanted hair is normally removed in the area to be treated, i.e., tweezing or waxing, the hair removal should be done at least 48 hours prior to your procedure. Do not resume any method of hair removal for two weeks following the procedure. Electrolysis should be avoided at least five days prior to the procedure. Must refrain from dying eyelashes and/or eyebrows at least 48 hours before the procedure. Wait one week after the eyebrow or eyeliner procedure before dying lashes or brows. If you are having lip liner done and have had previous problems with cold sores, fever blisters, or mouth ulcers, the procedure is likely to re-activate the problem. Your Permanent Cosmetic Technician can make recommendations to help prevent or minimize the outbreak. If you have visible sores, blisters, or ulcers on the day of the procedures we are unable to perform services. There must be a month between Dysport, Botox, or filler injections and permanent cosmetic services. as a client have requested that you describe the procedure so that I may make an informed decision whether or not to undergo the procedure. You have described the recommended procedure to be used as Micro Pigmentation, the process of implanting micro-insertions of pigment into the epidermal layer of skin. Micro Pigmentation / Microblading is a form of tattooing used for the purpose of semi-permanent cosmetic makeup. I understand that this description of the procedure is not meant to scare or alarm me. It is simply an effort to make me better informed. I acknowledge that I may give or withhold my consent for this procedure. I have informed Michelle F. Martinez that I am in good health and I am not under the care of any physician. Only fill out this bottom portion if you are under the care of a physician for a serious medical reason. - Hyperpigmentation is the darkening of an area of skin caused by increased melanin. I understand that allergic reactions to pigment are very rare, however, are possible. I understand that this procedure will involve pain and discomfort. I understand the markings are permanent and that there is a possibility of hyper-pigmentation resulting from a procedure, especially in individuals prone to hyper-pigmentation from a scar or other injury. I understand that a follow-up procedure may be required. Other risks involved with the procedure may include, but not limited to: infections, allergic and other reaction(s) to applied pigments, allergic and other reaction(s) to products applied during and after the procedure, fanning or spreading of pigment (pigment migration),fading of color and other unknown risks. I accept full responsibility for any and all, present and future, medical treatment(s) and expenses I may incur in the event I need to seek treatment(s)for any known or unknown reason associated with the procedure planned for me. I have been given an opportunity to ask questions about the procedures and the procedure to be used and the risks and hazards involved and I believe that I have sufficient information to give this informed consent. I certify this form has been fully explained to me and I have read it or it has been read to me. I understand its contents. I have read the Post Procedure Instructions (pages 8-9) and understand that I will receive a physical copy along with verbal instructions immediately following the procedure. I understand that there may be some pain involved during the procedure. Each person has a different tolerance level and pain felt will be according to each individual’s pain threshold. I understand that other adverse side effects, although rare, can include swelling, temporary minor bleeding, redness and pinkness, and soreness. I understand that there will be some fading of color. (Fading occurs more frequently to those with oily skin.) The technician has not guaranteed me as to how much color will stay. I understand that Permanent Makeup is a process and often requires several touch-up applications. I also understand that two or more applications of color (touch-ups) may be necessary to receive the desired outcome. Each touch-up appointment is an additional cost. We do not provide free services, under no circumstances. I accept full responsibility for the color and shape of each and every procedure receive. I take full responsibility for my eyebrows in regards to shape,color, and placement. I take full responsibility for the color and shape of my lips. 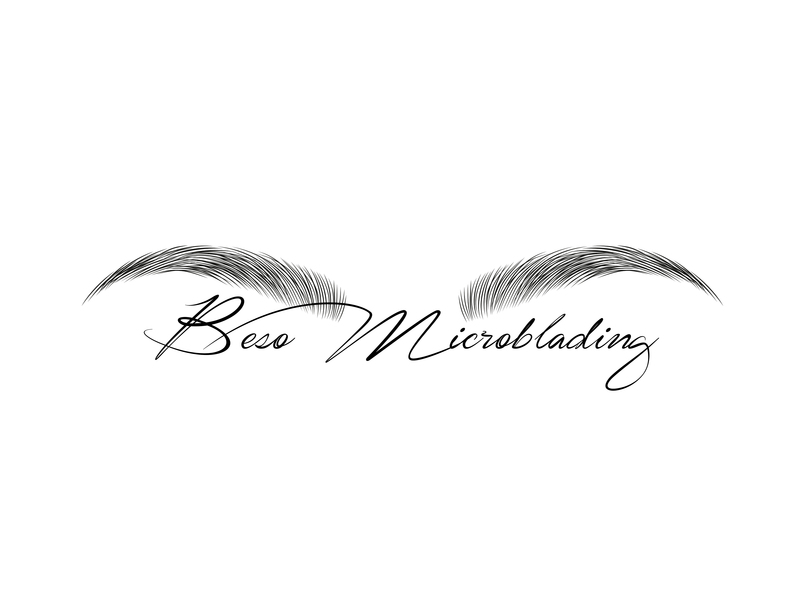 I understand that the Microblading Technician will review everything pertaining to this procedure before they begin. If YES, please refrain from using these products for at least a month after the procedure. Have you ever experienced hyperpigmentation from an injury? Are you currently taking aspirin or ibuprofen? Do you have a history of cancer? If Yes, When? Are you currently receiving chemotherapy or radiation treatments? **Beso Makeup shall not perform services on a person who is inebriated or incapacitated by the use of alcohol or drugs. Services will not be performed on persons with sunburn or other skin diseases or disorders (i.e., open lesions, rashes, wounds, punctured skin), psoriasis, or eczema present in the treatment area. **You will receive a copy of post-procedure instructions after your procedure is complete. For 7-14 days following application of permanent cosmetics: *Typical healing time varies by a person by person basis. An average of 7-14 days is needed for the treated area to completely heal. Properly cleaning the treated area is essential for retaining pigment and preventing infection. If treated area is not continuously cleaned dead skin will build up, producing hard scabs causing rapid pigment loss. Before cleansing thoroughly wash and dry hands. Use fingertips to gently clean treated area twice a day with a soft anti-bacterial soap. *(Recommended Cleansers: Cetaphil, Johnson’s hypo-allergenic baby wash, Dial Foaming Anti-Bacterial soap). After you have gently cleansed the intradermal cosmetic area with a mild antibacterial soap or coconut oil, use your fingertips to rinse with water and lightly pat the area dry. Do not rub or pick at the epithelial crust; allow dead-skin to flake off naturally. Absolutely no scrubbing, exfoliates, cleansing creams, or harsh chemicals. Apply A&D ointment, Hustle Butter, or coconut oil sparingly twice DAILY after cleaning until the procedure area has healed. Use a clean cotton swab to carefully blot ointment; do not use your fingertips. Do not expose the treated area to water pressure in the shower. DO NOT clean treated area during or directly after bathing. Heat from water or steam helps to relax and cleanse pores making skin prone to pigment loss. Wait at least an hour and a half after bathing to clean treated area or clean before bathing. Do not soak the treated area in a bath, swimming pool, or hot tub. Do not swim in fresh, salt or chlorinated pool water. Refrain from spray tans, tanning beds, and high-impact activities for two weeks or until completely healed. If high-impact activities cannot be avoided using a sweatband to absorb perspiration. Do not expose the treated area to direct sunlight. Avoid using sponges and makeup brushes while healing. If necessary, use clean fingertips to apply makeup, however, applying makeup skin has healed is not advised or recommended. Avoid sleeping on treated area while healing. If it is uncomfortable or difficult to refrain from sleeping on the area, use the Tegaderm Film. *Tegaderm film can be found at most drug stores in the Band-Aid aisle. Failure to follow post-treatment instructions may cause loss of pigment, discolouration, or infection. Remember, color may appear brighter and more sharply defined immediately following the procedure. As healing progresses, the color will lighten up to 60%. A follow-up/re-touch procedure may or may not be needed. If you feel as though a follow-up/re-touch is necessary, the best time to do so is within 45-60 days following the first procedure. You will be asked to schedule a follow-up at your first appointment. If follow-ups are not scheduled during the first appointment, we cannot guarantee a following appointment on the recommended time frame (45-60 days). Additional fees will apply for any and all appointments following the first procedure. All follow-up/re-touch appointments are $100.00 up to 3 months after the first appointment; NO EXCEPTIONS. A Color boost is necessary 6-9 months following the initial procedure to maintain color. Color boost range from $175 - $250. Pricing is determined on a person by person basis at the discretion of the micro blading technician. *ADDITIONAL FEES WILL APPLY FOR OUT-OF-STATE SERVICES. FOR YOUR CONVENIENCE, CAREFULLY AND THOROUGHLY READ THIS CLIENT COPY IN ITS ENTIRETY TO ENSURE PROPER KNOWLEDGE OF POST PROCEDURE AFTER-CARE. WARNING: In the event of an allergic reaction, infection, or abnormal inflammation/ swelling please contact the body art operator at 504-518-4461 or immediately seek emergency medical care or call 911. I hereby authorize Beso Makeup to take photographs of the work performed both before and after treatment, and I further authorize the use of said photographs to be used for the purpose of advertising. I hereby authorize Beso Makeup to take photographs of the work performed both before and after treatment to be maintained only on file. Please keep in mind that the following advice will play a huge part in the way your results appear after you’re finished healing. An aggregation disorder is when platelets do not bind with fibrinogen and other proteins in order to stick to other platelets. As a result, the platelets cannot form a plug to stop the bleeding from a damaged blood vessel. Pigment will not be put into anything raised. Due to hyper-sensitivity the skin may not take the pigment well. Due to the frequent production of sweat(salt), the pigment WILL NOT retain, fade very quickly, appear blurred or change in color. If you work out regularly (5-7 days a week), your eyebrows WILL fade very fast due to the production of salt/sweat. Salt is used to remove permanent makeup. They WILL appear more powdered or blurred under the skin as well. Microblading Techs reserves the right to refuse future services if she feels the results won’t be to the client's satisfaction. ABSOLUTELY NO SUN 30 DAYS AFTER (This means you cannot go out in sun with a hat and glasses on, this means no SUN or HEAT FOR 30 days at all) If you resume tanning, the results will fade quickly, heal darker, or not retain at all.